My Hero Academia Vol. 17 Review – AiPT! Few arcs in Kohei Horikoshi’s My Hero Academia have been as exciting as the fight against Overhaul and his yakuza. Vol. 16 did a great job kicking it off with fantastic action and chances for several heroes to shine. Vol. 17 is out this week, and the intensity of the battle is turned up to eleven. 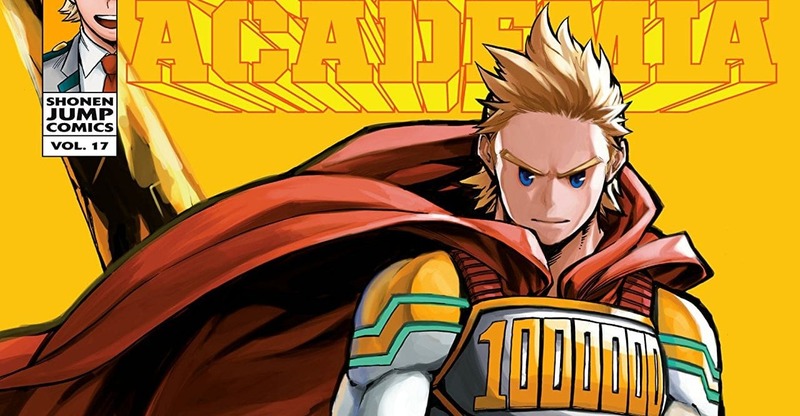 Lemillion catches up with Overhaul, but does he actually stand a chance against the mob boss? Can he save Eri, and will she allow herself to be saved? Plus, what are Twice and Toga up to? There’s a lot going on here, but are the various plot threads balanced effectively? Is this volume good? The strongest part of this volume is definitely its character work. All the buildup Lemillion has gotten since his debut culminates here in his awesome battle against Overhaul and his henchmen. We get to see who Lemillion really is when his back is up against the wall. In taking on several dangerous foes with no backup, he demonstrates why he’s so well-respected. It’s not just a matter of his power; his heroic spirit is next level. Of course, the action’s cool factor also owes a lot to his unique Quirk. This isn’t a perfect comparison, but imagine if Shadowcat’s abilities were honed in such a way that their wielder effectively became the series’ Superman. That’s Lemillion, and he’s awesome. Fortunately, Lemillion’s not the only character who gets a chance to shine here. Overhaul continues to be one of the series’ most interesting villains, and his brand of evil is distinct from that of other antagonists like Hero Killer Stain and Tomura Shigaraki. My main qualm with Overhaul here is just that his actions can get a bit confusing in the latter half. He undergoes a major power-up, and the details of how his Quirk works aren’t especially clear. His appearance after his power-up also leaves a bit to be desired. He takes on a much more colossal and fluid form, and while it sometimes shifts in very cool ways it often just looks generically bulky. Eri, Twice, and Toga all get some nice page-time here as well. Though Eri is largely a damsel in distress type of character, she doesn’t come across as being bland or one-dimensional. This volume’s insights about how she ended up in her current predicament provide context that fleshes out her personality and makes her easy to root for. She gets chances to make some decisions for herself, small though they may be, and it’s great to see. Twice and Toga have some amusing scenes as well. Though they’ve been called in to aid Overhaul’s yakuza, they’re ultimately wildcards whose questionable loyalty keeps things unpredictable and exciting. Art-wise, Horikoshi continues to impress. He’s one of the best artists currerntly working in the superhero genre, and he deserves a lot more recognition on that front. The energy and momentum throughout the action scenes is amazing. This is a series where you can really feel the impact of characters’ blows. Add in Horikoshi’s knacks for character design, page composition, and facial expressions and you get visuals that deliver on almost all counts. There are some occasional small clarity issues, and as I mentioned previously Overhaul’s enhanced form could be more memorable. Nonetheless, the art here rocks. Overall, My Hero Academia Vol. 17 is awesome. This is the cream of the crop of the superhero genre, and American comic fans are missing out if they don’t pay it attention. The art is full of energy, Overhaul is a great villain, and Lemillion gets time to shine. There are some small cons to this volume, but it’s still a must-read. The art is full of energy, Overhaul is a great villain, and Lemillion gets time to shine. There are some small cons to this volume, but it's still a must-read.